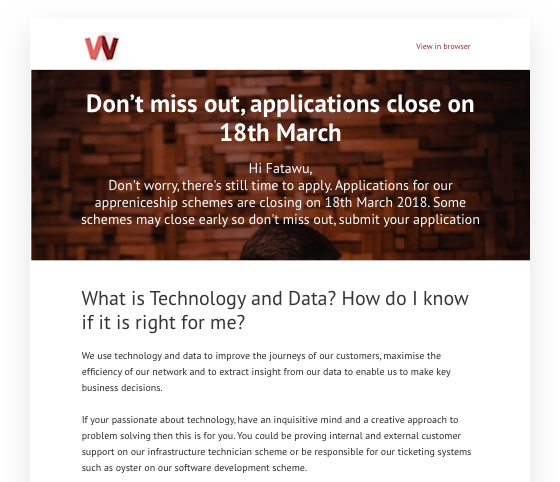 Use our communications platform to segment your data and send personalised emails to encourage students to apply to your roles. 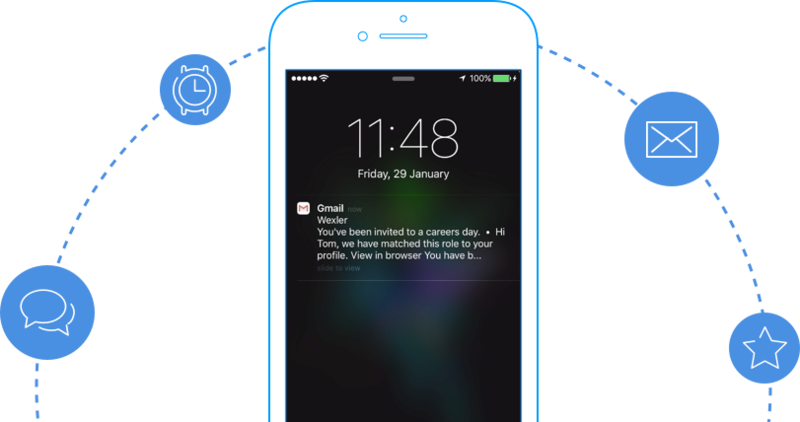 Save time by creating automated email loops to continue the conversation and nurture your Early Talent Pipeline. 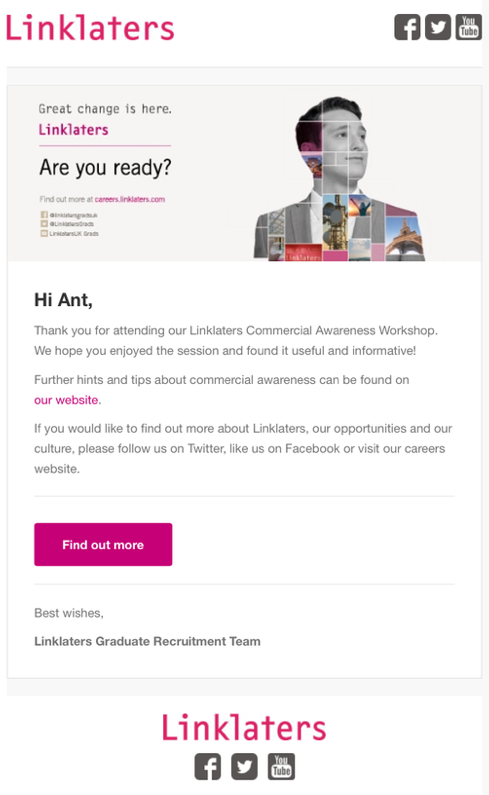 Promote your brand effortlessly through fully customisable branded email templates. Our client’s objective was to reduce the costs of printing graduate brochures that they took to careers fairs. 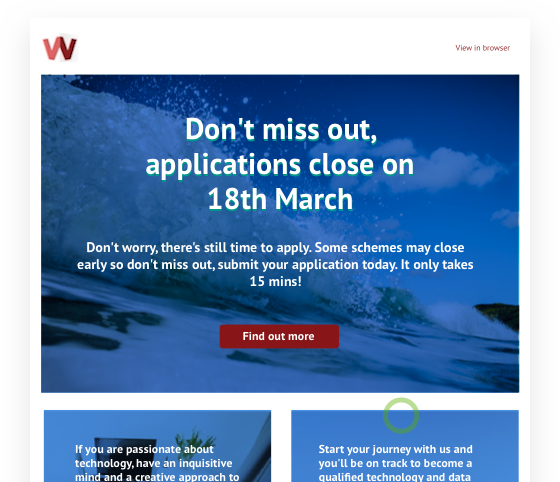 They trialled a digital strategy, where every student who registered with them at a fair (and was interested in finding out more about their opportunities) was sent an automated email immediately after registering, containing their graduate brochure. 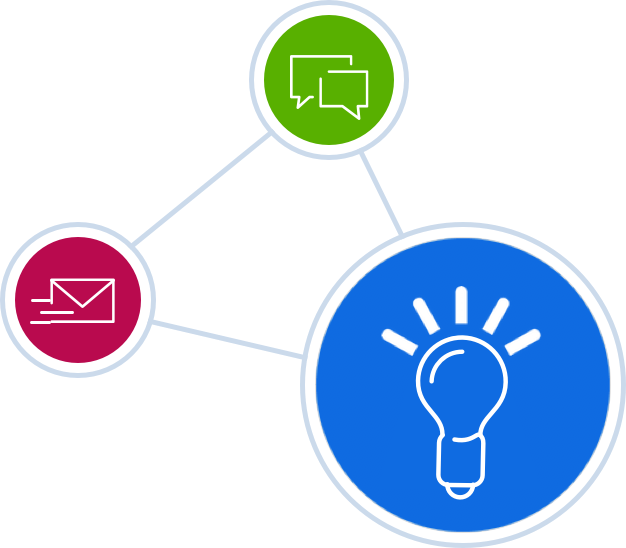 The emails achieved results open rates of 50% and click-through rates of 13%. 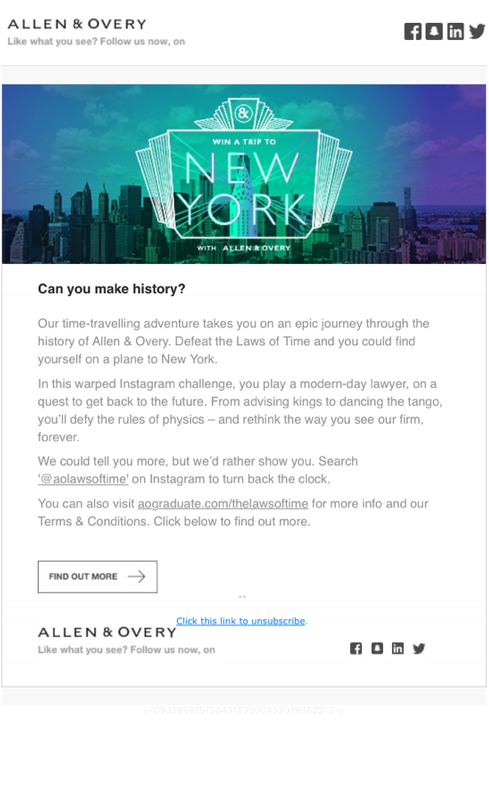 Almost 100,000 emails - some highly specific, some more generic - were sent out during one of our global banking client’s most recent campaign year. The overall open rate was 52% with a click-through rate of 6%. The most targeted communications, such as one promoting specific events across European cities, had click-through rates to the registration page of up to 23%. An email inviting students to join the Bank’s Talent Community saw a click-through rate to the sign-up page of over 30%. 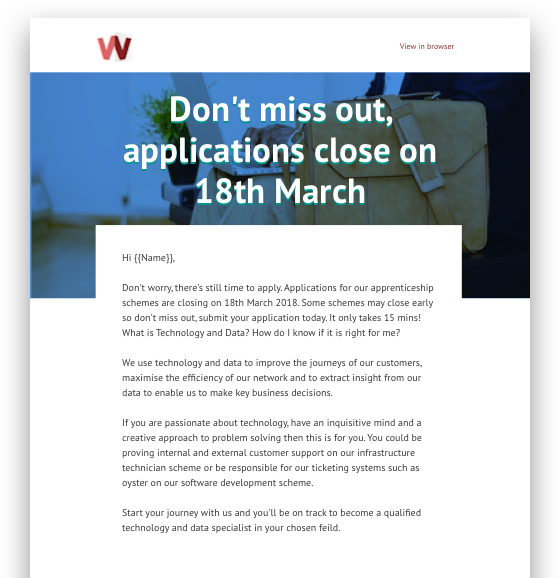 When applications opened for graduate and apprenticeship opportunities at one of our Engineering sector clients, they emailed the respective audiences inviting them to apply. 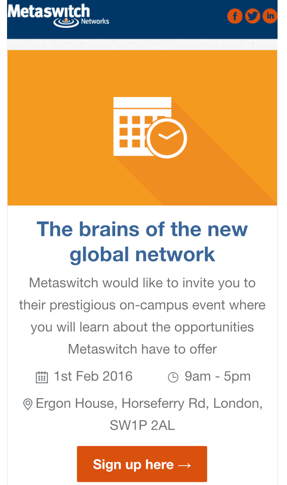 These emails were sent to 7,000 students, and saw some great engagement. 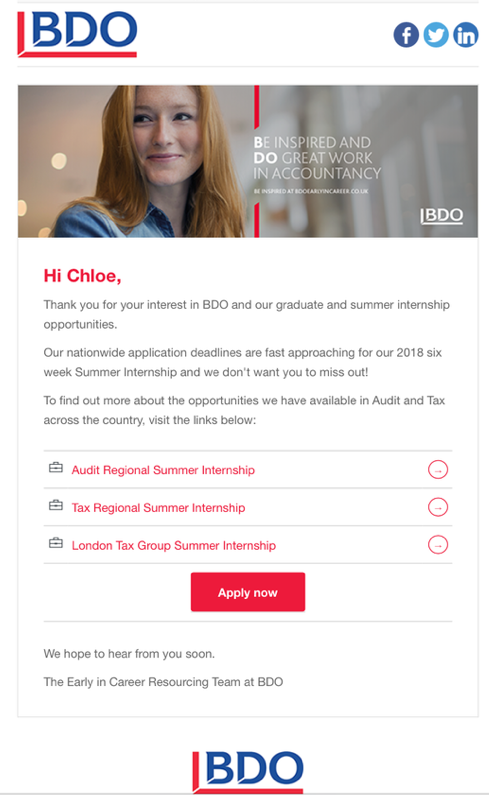 The email sent to undergraduates received an open rate of over 70% and click-through rate of 50%, whilst the one sent to those interested in apprenticeships reached an open rate and click-through of over 60%. A client wanted to attract more female STEM students, so they hosted a female-only STEM event. To invite the right audience, they segmented their Early Talent Pipeline and identified a target group of 1,200 female STEM students that they could market the event to. As this audience were already engaged, the email saw an open rate of 48% and a click-through rate of 20%, with 35% signing up to attend the event. By segmenting their audience, they were able to attract the right students to their event and ensure resources were being used effectively. In the long term, this proved an effective strategy to increase job applications from this segment.